The regular monthly meeting of the Franklin Town Board was called to order at 7:35 p.m. by Supervisor Jeff Taggart. Present were Garret Sitts, David Grant, Donnie Smith, Dwight Bruno, Paul Warner, Mark Laing and Supervisor Jeff Taggart. Also present were Jamie Archibald, Don Hebbard, Pete Bevilacqua, Bill Young, Tony Breuer, Cheryl Petersen, Katrina Worden, Jane Couch, Roger Reed, Gloria Banks, Derek McWeeney, Mike Howland, Paul DeAndrea, Dustin McNeilly and Jessica Reed. 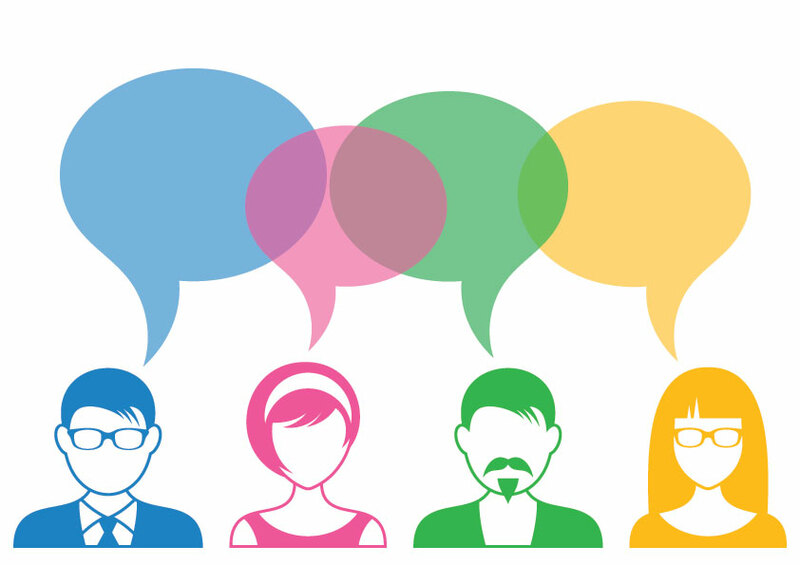 The minutes were read from the December 1, 2015 meeting. David Grant made a motion to accept the minutes as read. Dwight Bruno seconded the motion and all agreed. 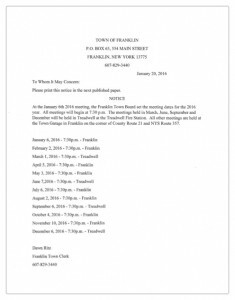 The regular monthly meeting of the Franklin Town Board was called to order at 7:30 p.m. by Supervisor Jeff Taggart. Present were David Grant, Don Smith, Lisa Huyck, Supervisor Jeff Taggart and Paul Warner. Absent was Garret Sitts. Also present were Carol Konkle, Caleb Zuk, Trevor Jacques, Jamie Archibald, Roger Reed, Louise Corsover, Shirley Ferguson, John Wilson, Bill Young, R. A. Cairns, Jessica Reed, Betty Fischer Fischer, Tony Breuer, Epifano Bevilacqua, and Don Smitn. Tne minutes were read from the November 1, 2015 meeting. There was a correction to read .7% increase for theFire District. David Grant made a motion to accept the minutes with the changes. Don Smith seconded and all present agreed. There was nothing new to report from the Planning Board. The regular monthly meeting of the Franklin Town Board was called to order at 7:35 p.m. by Supervisor Jeff Taggart. Present were Garret Sitts, David Grant, Lisa Huyck, Highway Superintendant Mark Laing, Paul Warner and Supervisor Jeff Taggart. Also present were Jamie Archibald, Mel Ogden, Pete Nero, Roger Reed, Tim Robinson, Bill Degenhardt, Stuart Anderson, Bill Young, Brian Brock, Jessica Reed, Cheryl Petersen, Don Hebbard, DonaldlSmith, Dwight Bruno And Pete Bevilacqua.